In a previous blog, we mentioned the changes in the Health and Safety at Work (Hazardous Substances) Regulations 2017 that will necessitate a rethink on how to manage aspects of secondary containment for hazardous substances. In this blog we would like to talk to you about containment specifically for 200L Drums. The rules around containment for drums haven’t changed much at all, but companies should be aware of what they are required to do. The highlighted section in the table below indicates how containment for 200L drums should be managed where the product being stored meets the threshold for containment. If for example you have one 200L drum of Class 3.1A liquid, you will be required to contain all 200L. To store this safely and effectively, we would recommend the use of an Ultra Spill Deck Bladder System. In this instance, a 1 Drum Deck with a Bladder Attachment would be used giving a total containment capacity of 291L. This unit is ideal for workplaces where space is at a premium as the static footprint of the unit is only 657mm x 775mm x 146 mm. Space, of course, must be left to allow the bladder to deploy effectively in the event of a spill. Ultra-Spill Decks are a modular system. None of the three sizes of decks, the 1, 2 or 4-drum modules, have enough capacity on their own to meet the spill containment regulations. As a result, UltraTech developed the concept of connecting them with bulkhead fittings so that they could share each other’s containment. To further extend the containment systems capability, UltraTech developed the Bladder System, which effectively adds 250L of capacity when connected to a deck system. More than one bladder can be attached to a deck or deck system, always remembering that space for bladder deployment is important. If it is prevented from doing so, containment capacity will be compromised. The bladder attachment consists of a bulkhead fitting, a 250L bladder and a rigid plastic housing to protect it. Should a small spill or leak occur, it will be contained in the Spill Deck’s sump. But in the event of a catastrophic spill, the bladder will automatically unfurl. Now, you’re probably thinking, “Okay, so now what am I supposed to do with that full bladder?” You would use a pump of some sort to remove the liquid from the bladder and put it into an approved container for disposal in accordance with local rules and regulations. Be sure when handling the spilled liquid, that appropriate PPE is worn. Bladders are single use, but replacement bladders can be purchased and retrofitted to the bladder holder. The P1 is a one-drum unit that is rated for up to 681kg UDL (uniformly distributed load) and has a total containment capacity of 291L. The P2 is the two-drum unit and it is rated for up to 1361kg UDL and has a total containment capacity of 333L. Note: with the addition of a small Spill Kit (70L to 80L) suitable for the product being stored, you would meet the regulatory requirements for 400L containment for 2 x 200L Class 3.1A product. And lastly is the P4 which can hold up to four 200L drums. It is rated for up to 2722kg UDL and has a total containment capacity of 416L. Additional containment can be gained using Spill Kits and/or floor bunding (refer to our previous blog on floor bunding). The Spill Deck Bladder Systems are covered by UltraTech’s 5-year warranty. This is the industry’s longest warranty and protects against any material or workmanship defects. Like most of UltraTech’s spill containment products, the Ultra-Spill Decks Bladder Systems are 100% polyethylene, so they have outstanding chemical compatibility and will not rust or corrode. The units are low profile for easier drum handling and are not forkliftable. The grating on all the modules is removable making clean up quick and easy. 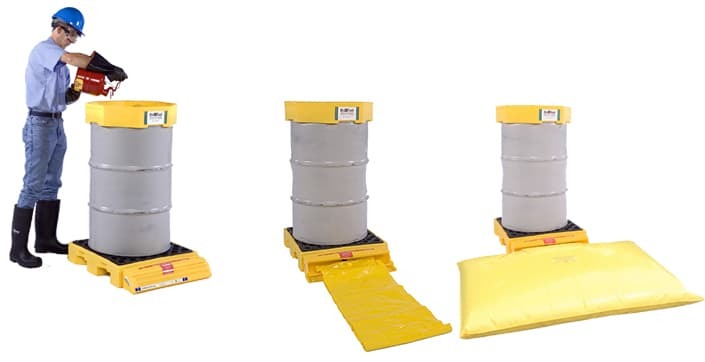 Finally, there is an optional loading ramp available to assist with drum loading and unloading. For more information about your requirements and or to talk through how we can help, contact us on 0800 323223, enquiries@dilnz.co.nz or via the website.